Continental Airlines calls it a new era in passenger comfort. The Houston-based carrier offers a sneak preview of what its new jet will look like from the inside. The Boeing 787 Dreamliner is making headlines for its cabin environment and advanced aerodynamic design. Continental will be the first U.S. carrier to fly the 787 beginning next year. Pat Hernandez has more. 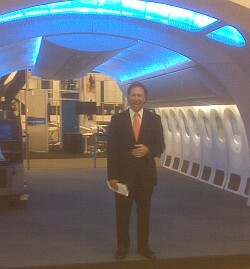 One corner of the National Business Travel Association International Convention and Expo at the Brown Convention Center was bustling with excitement, as a mockup cabin of Boeing’s 787 Dreamliner took the spotlight. Dave Hilfman is Continental’s senior VP for worldwide sales. He says the interior environment features larger windows, a more spacious cabin, increased overhead storage for carry-on luggage and ambient lighting. Boeing struggled with ongoing problems for the Dreamliner, which put it almost three years behind schedule. But Jeff Casey with Boeing says it is still the most successful pre-order launch of a commercial aircraft in the history of aviation. The 787 will seat 228 people and will cost between $161 to $200 million, depending on the model. Casey says Boeing has firm orders for 25 Drealiners from Continental.